IAB Ireland, as part of the global IAB network believes in an ad funded internet. We want to help brands reach their audiences and to provide revenue to publishers so they can continue to make their content, services and applications widely available. We believe ad blocking undermines this approach. IAB’s LEAN and DEAL initiatives are designed to provide a better UserX of digital advertising and minimise the use of ad blocking. IAB US, IAB Europe, national IABs and the IAB Tech Lab are also among the founding members and supporters of the Coalition for Better Ads along with leading international trade associations and companies involved in online media. The coalition is dedicated to improving consumers’ experience of digital advertising www.betterads.org. 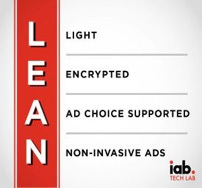 The LEAN Ads programme supported by IABs around the world introduces the next phases of advertising technical standards for the global digital advertising supply chain. The new LEAN formats are designed to provide better UserX of digital advertising across device. L: Light. Limited file size with strict data call guidelines. E: Encrypted. Assure user security with https/SSL compliant ads. A: Ad Choices Support. All ads should support DAA’s consumer privacy programs. N: Non-invasive/Non-disruptive. Ads that supplement the user experience and don’t disrupt it. IAB’s new ad portfolio is open for public comment at present until November 28th. We would very much encourage all involved in the Irish market to familiarise yourself with the proposed formats and have your say. LEAN Scoring will be introduced by year end and will facilitate ranking publishers, advertisers and by extension agencies on their adherence to the LEAN principles/criteria. IAB Ireland’s recent Research on Ad Blocking found that 89% of users would discontinue ad blocking on request. Lift restrictions or Limit access in response to consumer choice. An Ad blocking Detection Primer and Script is freely available to members of the IAB Global Network – also examples of publishers battling ad blocking are available here. – Encourage awareness of the standards among consumers and businesses in order to ensure wide uptake and elicit feedback.